After the Declaration of Independence on July 4, 1776, the newly formed state legislature authorized Francis Hopkinson, who had signed the Declaration as a delegate to the Continental Congress from New Jersey and would later be credited with designing the "Stars and Stripes" US flag, "...to employ proper persons, at Philadelphia, to prepare a silver seal, which is to be round...and that the arms shall be three ploughs in an escutcheon, the supporters Liberty and Ceres, and the crest a horse's head. These words to be engraved, in large letters, round the arms, viz: 'The Great Seal of the State of New Jersey.'" Hopkinson retained Pierre Eugene du Simitiere, an artist and Swiss native residing in Philadelphia who served as the artistic consultant for the committees that designed the Great Seal of the United States, and who also suggested the adoption of the US motto E pluribus unum ("Out of Many, One"). 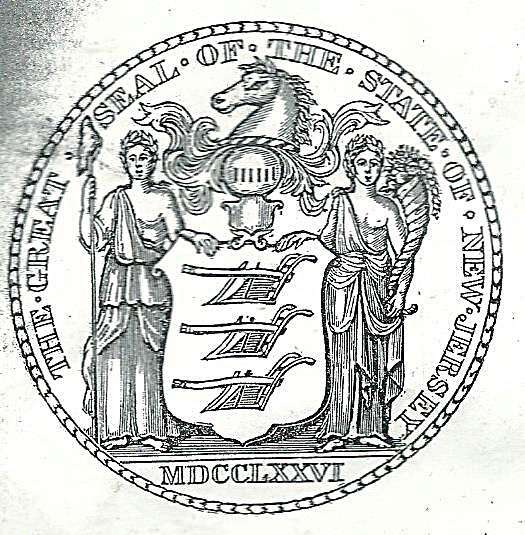 In addition to designing New Jersey's seal in 1777, du Simitiere also designed the seals of Delaware and Georgia. 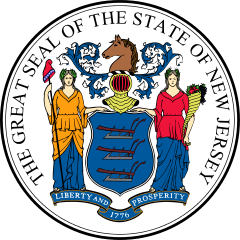 The seal contains symbols signifying themes and interests : the helmet and the horse's head crest represent New Jersey's independence as a state and its status as one of the first states; the woman holding a staff with a liberty cap on top is Liberty, who represents freedom, with the caps worn as a sign of patriotism during the Revolution; Ceres, the Roman goddess of grain, holds a cone-shaped basket called a cornucopia, filled with fruits and vegetables produced in New Jersey and the three plows on the shield also symbolize the agricultural tradition of New Jersey. The state's motto "Liberty and Prosperity" is written on the scroll at the bottom of the seal. The New Jersey State flag displays the State seal and the official State colors of Jersey blue on a buff background with the State seal. The colors were chosen by General George Washington in 1779. According to some accounts, the colors were selected to honor the original Dutch settlers of New Jersey--with the colors of Holland being dark blue and buff--and were the same colors selected for New York, which also was first settled by the Dutch. The flag was displayed on the march through New Jersey of the combined French and American armies as they traveled south to trap the British army under Lord Cornwallis at Yorktown, leading to his surrender on October 19, 1781. Although displayed frequently after the Revolution, the flag was not adopted officially as the state flag until a joint resolution was approved by the Legislature in 1896. The Eastern (or American) Goldfinch is found throughout New Jersey, usually nesting high in trees. The male has bright, glowing yellow feathers and a black tail and cap, with white below the tail, head and wings; in contrast, females lack the dramatic color contrasts, having only a yellowish blush above and below the head and no black cap. Breeding season commences sometime between June and September, with most females producing only one brood per year. The majority are year-round residents in New Jersey, but many migrate south from late September to late November. Iowa and Washington State also have designated the American Goldfinch as their state bird. New Jersey is a leading national center for birding, particularly due to its location in the Atlantic Flyway, the principal route for migratory birds on the Atlantic Coast. The state's leading birding organization, the New Jersey Audubon Society, sponsors the annual World Series of Birding, a competition in which teams from around the country come to the state to identify as many species as possible in a 24-hour period. The Society also maintains refuges throughout the state and sponsors many regional and local events. Male American Goldfinch singing in spring when around a female to signal its territory and warn off other males. 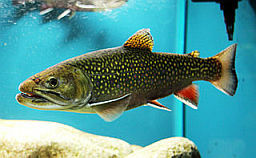 The eastern brook trout (Salvelinus fontinalis) was designated in 1992 as the State Fish of New Jersey. It is most populous in highland areas with the clear, cold and highly oxygenated waters essential to its habitat. A study published in 2008 by the New Jersey Division of Fish and Wildlife concluded that wild brook trout in the state are descended from the native species that were found in the northeast following the retreat of the glaciers of the last Ice Age some 12,000 years ago. Typical lengths of the brook trout vary from 9.8 to 25.6 inches, and weights from 0.66 to 6.61 pounds. The current state record brook trout was caught on May 1, 1995, in the Rockaway River and weighed 7 pounds, 3 ounces and was 23 inches in length. The fish is dark green to brown in color, with a distinctive marbled pattern of lighter shades across the flanks and back and extending at least to the dorsal fin, and often to the tail. The brook trout is among the 600,000 trout raised at the state's Pequest Trout Hatchery annually stocked statewide in rivers and streams. The Common Meadow Violet (Viola sororia) was officially designated by the state legislature as the state flower in 1971, although prior attempts were made in 1913 and 1963. The Common Meadow Violet is the most common of over 400 species of violets and is found growing in marshes, damp woods and along roadsides. From March to June, it produces small blooms ranging in color from white to blue to purple on separate, slender stalks. The flowers extend from Paterson to Atlantic City in the south. 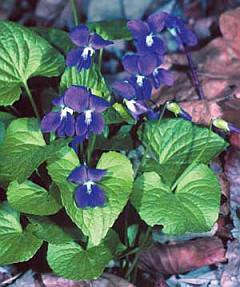 Illinois, Rhode Island and Wisconsin also have the violet as their state flower. 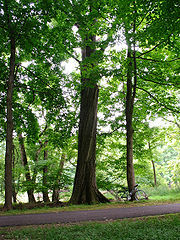 New Jersey also hosts several public arboretums. The Garden Club of New Jersey provides information on gardening activities relating to New Jersey, as well as a listing of 120 local clubs with 5,000 members. The New Jersey Agricultural Experiment Station at Rutgers University conducts research and publishes information on resources and common problems relevant to gardening in the state. The horse was named as the State Animal by a Joint Resolution approved by the Legislature and signed by Governor Brendan Byrne in 1977 which followed a lobbying campaign by elementary school students and equine advocacy groups. The horse's significance in the state's history is illustrated by the inclusion of a horse's head prominently displayed at the top of the State Seal. Until being supplanted by the motor vehicle in the first decades of the 20th century, the horse was the dominant means of transportation and of providing power for agricultural cultivation. Based on the most recent data of a study conducted in 2007, New Jersey had some 42,500 equine animals, with some 30% engaged in racing activities. The state's racing industry, with major tracks at The Meadowlands, Freehold Raceway, and Monmouth Park has been in long-term decline, primarily due to competition from casinos and other forms of legalized gambling, aging of the demographic of racing enthusiasts, and the growth of other leisure and entertainment offerings. Although New Jersey breeders have increasingly cited declining state-subsidized purses as undermining their competitive position with tracks in nearby states in attracting high-quality horses, the state continues as the site of the Hambletonian Stakes, the first event in the Triple Crown of Harness Racing for Trotters held since 1981 at the Meadowlands, and the Haskell Invitational at Monmouth Park, which annually attracts some of the nation's leading thoroughbreds. Apart from racing, horse farms also have been impacted by development pressures and increased operating costs, including taxes and liability insurance. Resources related to horses in New Jersey include the state Department of Agriculture, which maintains an Equine Advisory Board of representatives of diverse segments of the equine community; the New Jersey Racing Commission, which regulates tracks, trainers, jockeys and other personnel; the New Jersey Horse Council, a nonprofit advocacy and lobbying group incorporated in 1974; and The Horse Park of New Jersey, an 185-acre equestrian facility in Allentown which hosts many events and competitions. New Jersey also serves as the home base of the United States Equestrian Team, which is located at 180-acre Hamilton Farm in Gladstone, the former property acquired in 1911 by Wall Street financier James Cox Brady; the Farm hosts the Team's training for the Olympics and other world championships, as well as events such as the Dressage National Championships and many horse shows, dressage, driving events and training clinics. The northern Red Oak (Quercus rubra) is a native of North America growing in the eastern and central US and southeast and south-central Canada. In autumn its leaves turn a bright red and it produces many acorns. The northern red oak is so named to distinguish it from southern red oak (Quercus falcata), also known as the Spanish oak. It prefers good soil that is slightly acidic. New Jersey is the only state to designate it as a state tree, but it is the provincial tree of Prince Edward Island in Canada. 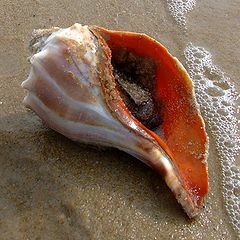 The knobbed whelk (Busycon carica), commonly known as the conch, is found along beaches and bays, with the shell taking its name from the large marine snail that lives in the shell. Also known by its Italian name, scungilli, the snail is harvested from its spiral shell and canned for food. The shell is yellowish gray in color and is often prized by shell collectors. Of the 14 states which have designated state shells, New Jersey and Georgia are the only ones with the knobbed whelk, although other whelk types are listed by Massachusetts (Wrinkled Whelk) and Texas (Prickly Whelk). 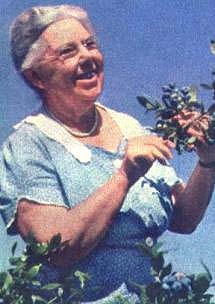 Blueberry was first cultivated through work in 1911 by Elizabeth White, daughter of owner of extensive cranberry bogs at Whitesbog in Pinelands, and William Colville of US Department of Agriculture and later first director of National Arboretum, whom White had invited to family farm to assist her in efforts to develop blueberry as commercial fruit. Designated as official state fruit in 2004 as result of lobbying campaign initiated in 2003 by fourth graders at Brick Township school, who conducted media interviews, petition drive, presentations to local governing bodies and state legislative committees. 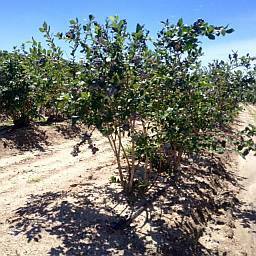 According to New Jersey Department of Agriculture, 8,800 acres of blueberries on 254 farms were harvested in 2014 with a value of $79.5 million, making New Jersey the fifth largest producer of blueberries in US. Department of Agriculture estimates that there are 20,000 bee colonies, valued at $350 per colony, representing a $7 million honey bee industry in New Jersey.As in other areas of the country, however, the state's honey bee population has been adversely impacted in recent years by the sharp increase in deaths of colonies; nationally, losses have exceeded 30% to 40% of all colonies each year. The cause of the increase remains uncertain, although parasites, pesticides and habitat loss all have contributed to decreasing populations. As pollinators along with flies, beetles, wasps, butterflies, hummingbirds and bats, bees are essential for most plants to produce seed, including vegetables and flowers. Founded in 1902, the New Jersey Beekeepers Association now numbers about 1,000 members. Of the 45 states designating official state insects, the honeybee is by far the most popular choice with a total of 17 states. In addition to New Jersey, the honeybee is also an official insect of Arkansas, Georgia, Kansas, Louisiana, Maine, Mississippi, Missouri, Nebraska, North Carolina, Oklahoma, South Dakota, Tennessee, Utah, Vermont, West Virginia and Wisconsin. A.J. Meerwald a restored oyster dredging schooner, first launched in 1928, home port at Bayshore Center at Bivalve in Commercial Township in Cumberland County, which also includes museum of oystering and maritime artifacts. One of hundreds of schooners built along South Jersey's Delaware Bay shore before decline of shipbuilding industry in 1930s during the Great Depression. 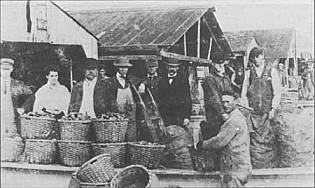 Bivalve and Shellpile sections of Commercial Township became leading oyster ports, with large communities of African Americans working on ships and as shuckers and in packing plants. During World War II, A.J. Meerwald converted by US Coast Guard for use as a fireboat, later returned to oystering until donated 1989 for nonprofit educational uses. 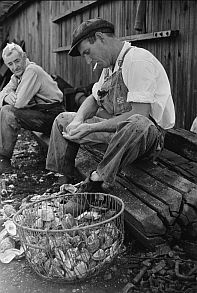 The oystering industry reached its peak in 1955, declining by 1957 due to an oyster pathogen which killed 90% of the oysters. A.J. 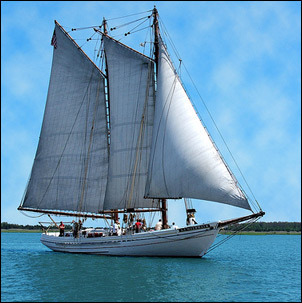 Meerwald currently used for onboard educational programs in Delaware Bay near Bivalve, and at other ports in New Jersey, Pennsylvania, and Delaware region, also has represented New Jersey in "tall ship" events. Ship added to National Register of Historic Places in 1995, designated by state legislature resolution as state ship in 1998. Designated in 1994 to mark significance of 1858 discovery in Haddonfield of first virtually complete dinosaur fossil found in modern times. Discovery led by William Parker Foulke, a Philadelphia lawyer and activist for prison reform who also was an amateur natural historian and geologist. On vacation in Haddonfield during summer of 1858, Foulke heard that twenty years before, workers had found gigantic bones in a local marl pit. A member of the Academy of Natural Sciences in Philadelphia, Foulke hired a crew who spent weeks digging in the pit until they uncovered the bones of an animal larger than an elephant with features of both a lizard and a bird. 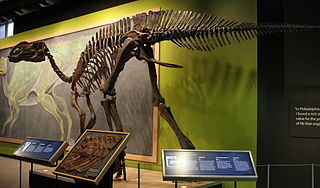 The entire skeleton was completely assembled in 1868 by a team and put on display at the Academy of Natural Sciences--the first-ever mounted dinosaur skeleton. Dr. Joseph Leidy, fellow member with Foulke of Academy of Natural Sciences, named new specimen Hadrosaurus foulkii, or "Foulke's bulky lizard," with Leidy's research on fossil credited as forming basis of modern understanding of dinosaurs. A statue of the dinosaur also is displayed in downtown Haddonfield. New Jersey is one of seven states with an official state dinosaur, others Colorado, Maryland, Missouri, Oklahoma, Texas and Wyoming. The Square Dance was designated as the "American Folk Dance of the State of New Jersey" by Joint Resolution of the Legislature approved by Governor Thomas Kean on January 19, 1983. In part, the Resolution declared: "The Square Dance, which was first associated with the American people and recorded in history since 1651, has consistently been the one dance traditionally recognized by the American people as a dignified and enjoyable expression of American Folk dancing; and WHEREAS, Official recognition of the Square Dance will enhance the cultural stature of New Jersey both nationally and internationally; and WHEREAS, National and international prestige is in the best interest of all Americans; now, therefore, BE IT RESOLVED by the Senate and General Assembly of the State of New Jersey: 1. The dance known as the Square Dance is designated the American Folk Dance of the State of New Jersey." The nonprofit Square Dance Council of New Jersey was founded at the time of the approval of the Joint Resolution in 1983, and includes regional groups throughout the state seeking to preserve and promote square dance activity.